Here's another recipe that is great for Thanksgiving turkey leftovers. I usually make this casserole with cooked, cubed chicken, but it adapts very nicely for turkey too. In fact, I think just about anything tastes good bathed in a mixture of cream of chicken soup and sour cream! All you need to make this a meal is salad and a simple vegetable. The casserole freezes well before baking and reheats in the oven -- especially good to know if you're tired of turkey for now, but know you'll need a fast and easy dinner in another couple of weeks when the Christmas crazies strike. Preheat oven to 350 degrees. In a large bowl, mix cream of chicken soup and sour cream. Stir in chicken or turkey and pour mixture into a flat casserole dish. In a small bowl, mix together crushed Ritz crackers, melted butter and poppy seeds. Sprinkle cracker mixture over top of chicken mixture. Bake for 30-40 minutes, until top is browned and sauce is bubbly around the edges. You know the drill. Thanksgiving and then leftover turkey in a wide variety of incarnations, until you can't take it anymore! Well, here is another one! This Turkey Tetrazzini can be made with other meats - chicken, shrimp, etc. The recipe makes a generous amount - enough to feed a hungry family or a small dinner party. I first had this when I was in college and it was in the regular rotation of meals at my sorority house. We loved it then, and still find it to be a simple meal with lots of comforting goodness. There are a few variables to decide before you make this dish - such as meat, wine or sherry, cheddar or another cheese, green or black olives, green or red pepper - let your palate and your pantry determine how you will mix it up. If you want to make a simple, yet satisfying dinner with leftovers this week, Turkey Tetrazzini is a delicious reincarnation of the Thanksgiving bird - and you don't have to spend all day making turkey stock before you can enjoy it! Cook spaghetti and drain. Mix turkey, mushrooms, green pepper, olives, onion, salt and pepper, and 1 1/2 c. cheese. Mix mushroom soup, chicken broth and wine or sherry and pour over spaghetti mixture until well blended. Pour into lightly greased 13” x 9” baking dish. Sprinkle remaining cheese over top. Bake at 350 degrees for about 45 minutes. TURKEY SANDWICHES I HAVE KNOWN AND LOVED could easily be the title of this post and the story of my life for the few days after Thanksgiving. In fact, I may have to go out and buy a turkey breast, just to have enough turkey to make all my favorite turkey sandwiches. The Pier 39 sandwich is one we had in San Francisco, way back when, and marked the first time I'd encountered cranberry sauce on a sandwich. I was an instant fan! We had the sandwiches with Anchor Steam beer. It was a great day! The Dam Turkey Sandwich is one we used to eat in Tamworth NH, at a little gift shop and restaurant that sat beside a river where you could sit outside and watch water spilling over the dam. Such a lovely setting! The sandwich became a favorite and we never missed going there during our annual summer visits up north. This sandwich also marks a first - the first time I had dressing as a sandwich ingredient - but definitely not the last! Pita bread makes the perfect "container" for all the delicious ingredients. Click here to see Grandma Elsie's Potato Rolls - Day One for the recipe! The dough rose overnight and looked great this morning. Today we went to Sonnet's house to finish making the rolls. Sonnet rolled the dough and cut it and I dipped, folded and placed the rolls in the pans. The recipe is easy to make in the Kitchen Aid, not much working the dough, a single batch makes a lot of rolls, and pre-baking makes them fast and easy when it's time for dinner. It took a little while to make that many rolls, but I know we'll be happy on Thursday when everyone gobbles them up. We had four beautiful batches of dough and ended up with 8 9x13" pans of rolls. Remember, the rolls are pre-baked and then baked again for a short time before serving -- kinda like homemade brown and serve rolls, but sooooo much better! The taste test proves Grandma Elsie's potato roll recipe is a winner! The dough has to rise overnight. Tomorrow I will take the four batches of dough to Sonnet's house so we can roll them out, cut the rolls, and set them in pans to rise. Then it's into the oven to bake. On Thursday, we will just have to reheat them for a few minutes and they'll be ready to serve! Although I've never tasted these rolls, I have Sonnet's recommendation and that of her family. Good enough for me! Well, that, and I tasted the dough and it was excellent -- I just know they'll be a big hit. Tonight - pictures of the process. Tomorrow - pictures of the rolls. Stay tuned! Mix sugar and butter together with stand mixer; add salt, eggs, milk and mashed potatoes and blend well. Add flour, one cup at a time until dough is stiff and sticky. Place in a lightly greased bowl and cover with a clean lightweight dish towel and let rise overnight in a cool place. Divide dough into two batches. Roll out one batch of dough to ¼-in. thickness on a lightly floured surface. Cut into circles with a donut-size round cutter. Dip cut out dough into melted butter and fold in half. Put into pan to rise. Let rise until triple in size. Bake at 425 degrees for 10 minutes. Reheat at 350 degrees for 10 minutes. Dough can be in refrigerator for up to one week before using. My first Thanksgiving away from my family's table was the year I got married. It was horrible! Not because I didn't love my husband and his family, which is where we spent that holiday. It was because the food was foreign to me. Nothing was right and it made me miss the Thanksgiving foods I'd grown up with, and my family too, of course. The strangest thing of all was my mother-in-law's stuffing. First of all, my family never stuffed a turkey. They stuffed themselves, definitely. Turkey, never! Now I was not only confronted with some gooey mess pulled from inside a turkey, but it had hamburger in it! What were they thinking? Our stuffing -- the only kind I'd ever eaten -- was baked in a separate pan and was called dressing. As I wrote earlier, my family had to have two kinds of dressing to begin with -- oyster and plain. I never ate the oyster kind. And another matter was having enough dressing to feed our big, carb-hungry family. There was no turkey that could hold that much stuffing inside -- not even trussed! Now, there is not any question about Lorraine's stuffing being good. It was good made with hamburger, in and of itself! It just wasn't right. It wasn't dressing. So it wasn't Thanksgiving to me. I simply wasn't prepared for people who did things differently that first year I was away from home, but I learned quickly. Well, maybe not by the next year, because we had a huge Thanksgiving dinner with our entire Air Force pilot training class in Texas. And, I guess, not the next year either, when we were in California and shared Thanksgiving with our friends who were there with us for the second phase of pilot training. In both cases, I did not have the necessary experience to contribute such an integral part of the holiday meal to a group of people who had more marital and military rank than us. I guess I finally made our first Thanksgiving dinner the fourth year of our married life, when we were living at our first permanent assignment in North Carolina. I remember negotiating a couple of family traditions between us, and then sort of creating our own hybrid holiday meal. You know though, I don't remember a thing about the meal itself. Except my family's tradition won in the dressing category. Both of My Favorite Husband's brothers and his sister, and almost all of my brothers will be here to celebrate the fourth year of our new hybrid tradition -- Thanksgiving dinner at our house. My mother will be making the plain and oyster dressings for our holiday table. But you know, I'd give anything if Lorraine was still here to make her stuffing with hamburger. I'd love to taste it again. Cook and crumble ground beef; drain fat and set aside. Pour water/broth into a large pot and bring to a boil. Add butter, onions, and celery; reduce heat to simmer for 5 minutes. Add cooked hamburger and remaining ingredients; mix until well blended. This makes enough to stuff an 8-lb. turkey. Double or triple the recipe for a larger turkey. Stuffing may also be baked as dressing in an oblong baking dish, if you prefer not to stuff the turkey. My family has always served dressing instead of stuffing for Thanksgiving dinner. We are dressing lovers, so there is no turkey that would contain the amount we need to satisfy everyone. Plus, we like it to be a little firmer than the gooey mess that is baked inside the turkey. However, we are divided into two camps when it comes to the kind of dressing we like -- plain or oyster -- so we have both! I am not a huge fan of oyster dressing. I find the flavor of oysters, which I love in most any other form, to be too intrusive when I eat dressing, so I fall in with the Plain Dressing crowd on Thanksgiving. Many fond memories are associated with Thanksgiving in my mind, but one of the sweetest is watching my grandmother and great-aunt Martha mixing the dressing. Actually, my grandmother was usually mixing, and then asking Aunt Martha to taste for seasoning. Aunt Martha cooked in her own kitchen and always brought delicious food as her contribution, but rarely did I see her cook at family gatherings. However, she was the acknowledged authority for tasting, and was happy to step in when her services were required. As I observed this ritual between sisters, nothing appeared less appealing to me than dipping into a big bowl of uncooked puddingy wet bread. Yuck! And then, they dumped in those disgusting slimey gray raw oysters and tasted again . . . that did it! I was done! No oyster dressing for me! Below is the recipe, the one now used by my mother and brother to create my family's favorite oyster dressing. I'm not sure which one is the mixer, and which is the taster, because they make it at home and bring it to Thanksgiving dinner at my house -- channeling Aunt Martha. I am most grateful for that, as I don't have to look at the gooey mess that delights them so much, once baked. I've tasted the Oyster Dressing and they can have it. Afterall, there is no shortage of tempting flavors on a day devoted to goodness and plenty. And they do make a fine Plain Dressing too, so I let them bring a big batch of it, for those of us who prefer our oysters fried, or steamed, or not at all. Gobble, gobble! 1. Tear bread into pieces and allow to get stale for one day in brown paper bag or allowed to dry partially. 3. Pour butter and veggies over bread in a large mixing bowl. 4. Sprinkle in dry seasoning and toss to blend. 5. Lightly beat eggs and add to mixture. 6. Pour in oysters with liquor and fold until well blended. 7. Mixture should be creamy and wet, if not add some chicken stock. 9. Bake at 350 F for about 45 minutes in covered casserole; uncover and bake for additional 15 minutes. Thermometer should read at least 205 degrees when done. My neighbor, Phyllis, is a postmaster and a very busy woman. Last week she brought me a bowl of her Cranberry Salad -- two weeks before Thanksgiving! It seems that, like so many busy women, Phyllis is extremely organized and has mastered the holidays with a little bit of planning ahead. When cranberries appear in the store, Phyllis buys them and makes up the Cranberry Salad she takes for family holiday gatherings. Her version can be frozen, so it's perfect for making ahead of time. The clever part though, is how she freezes it in her holiday dishes -- ready to pack up and take to dinner anywhere, anytime. Phyllis says she lets the dish sit out for a while and then fluffs it up a bit and it's ready when they put dinner on the table. How smart and easy is that! Mix all together and place in a pretty dish, ready for serving. Cover with plastic wrap and place in freezer. Remove about 1 hour before serving and enjoy. Maybe it's the 20-degree nights or the time change, but I just love something warm and comforting for dinner when it gets cold and dark so early, like it has this week. And I would love to get up early and make a nice hot breakfast everyday, but that's not going to happen, so sometimes I like to have breakfast for dinner. A couple of weeks ago, I made some French Toast that was sooooo good, I can't stop thinking about it. So that's what I've got for dinner this week. Adding a little bacon, or some of your favorite sausage, and maybe a medley of fresh fruits makes it a total meal. And such a sweet treat for dinner means no need to make dessert. E-A-S-Y! The perfect end to a busy day when you just want to go home and curl up in your jammies. Click here to link to Menu of the Week #8 and the recipe for Insanely Delicious French Toast over at Prairie Wood Kitchen. Welcome! I am still amazed at the number of people searching for information about Indian Trail Cranberry Orange Sauce who find their way here in search of information or a recipe to make the sauce and/or jello salad themselves! If you would like, please leave a comment about your ITCOS memories and what lead you here. And please stop back by Cora Cooks anytime during the other 364 days of the year -- we're always cooking up something good and we would love for you to join us as a regular follower or subscriber! After all, we love the same food! Happy Thanksgiving! It seems that Indian Trail Cranberry Orange Sauce is no longer being produced, as of this year. I have had over 200 300 2000 searchers land here looking for information, so I thought I would add this update. Scroll down to find the recipe for my own version of ITCOS, created years ago when we lived in NC and I could never find it for Thanksgiving. Please send me an email at coracooksblogATgmailDOTcom, if you find Indian Trail this year! Chop all ingredients in a food processor or a food grinder and stir to mix. Refrigerate until ready to use. Be sure to let it drain a while to remove the excess liquid before mixing it with Jello. This is it! Indian Trail Cranberry Orange Sauce for the cranberry jello my grandmother used to make, and my mother now makes, every Thanksgiving. I've loved it since I was a child. If you are not a jello fan, this version may not win you over because it is a jello mold kind of thing. If you do like molded jello, this is a good one. Cranberry lovers, you'll find plenty of tart cranberry flavor and crunch. Our family recipe is adapted from the recipe on the Indian Trail label. Locally, I've found it at our Schnuck's store in the freezer case with the frozen fruits and juices. If you don't find the Indian Trail stuff, then you can easily make your own, if you have a food processor. Not quite as easy, but still doable if you don't have a food processor. You'll need 1 bag of fresh cranberries, 1 whole, seeded orange with peel, and one cup of sugar all chopped and blended together in a food processor or a food grinder. Be sure to let it drain a while, to remove the excess liquid, before mixing it with Jello. That's it! Just that simple. Chock full of cranberry goodness and the stuff of happy holiday memories. Dissolve gelatin in boiling water. Stir in Indian Trail Cranberry Orange Sauce and pineapple. Pour into mold. Refrigerate until firm. I really love cranberries. I attribute this to a very positive early experience with them. During the time that my grandmother lived at the family farm, she always hosted our family Thanksgiving. She and her sisters would prepare the dinner. They were all good cooks, each bringing her own special gifts to our Thanksgiving table. One of my grandmother's Thanksgiving specialties was yummy cranberry jello. It was a simple, yet elegant blend of tart Indian Trail cranberry relish mixed into sweet red jello. I guess part of the appeal of this cranberry jello to small children was the mitigated pucker factor. And let's face it, those nasty, mushy gray-green Brussels sprouts could not hold a candle to a wiggly red molded wonder. To my already discerning palate though, there was also that satisfying crunch from the cranberries inside the jello squish. When it came time for me to host my own Thanksgiving years later, I needed the cranberry part of my Thanksgiving memories on that table so far from home. Jello was no problem, of course, but the Indian Trail did not extend to my little corner of NC. I was forced to do what I discovered was going to be a necessary element to my success as a young cook far away from all that was taken for granted at home -- deconstructing and reconstructing a recipe. 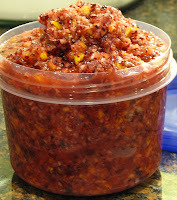 Of course, making a simple cranberry-orange-sugar relish was not complicated. Just chop till your arm aches, and keep on chopping. Yeah, in the pre-Cuisinart era, I didn't even have a food grinder. But I persevered and created an acceptable substitute for my grandmother's cranberry jello that year, and forever after. Since then, I've developed a real thing for cranberries and I've collected several good recipes. I love those little red pop-beads with the tart crunch. A turkey sandwich is a rare and special treat when sauced with some sort of cranberries and cushioned with stuffing and lettuce. And almost any cranberry sauce will enhance any of the other seasonal roasted meats or fowl. I realize that my fondness for cranberries places me in the minority. But c'mon, a grainy cylinder wiggling around on the Thanksgiving table does not have much to do with the real cranberry. Keep it on the table if you must, I'm not here to stomp on your holiday memories. I've been known to slice a slab for a turkey sandwich, when necessary. Is this the year you'll set out for a new world of abundant goodness, free from cylindrical cranberry sauce? We'll probably have at least three kinds on our Thanksgiving table -- the wiggly cylinder for my son, our traditional cranberry relish jello mold now made by my mother, and a newer favorite I make from a recipe in a very old issue of Victoria magazine. Brandied Cranberry Sauce is so delicious -- a little bit sweet, a little bit tart, with a little crunch, and a little punch. Gobble, gobble! Rinse cranberries and remove damaged berries. In a medium saucepan, combine cranberries, maple syrup, brandy, sugar, orange zest and juice, cinnamon, ginger, and cardamom. Bring to boil, stirring to dissolve sugar. Reduce heat to medium. Continue simmering, stirring constantly, until all berries have popped and the sauce is a velvety juice, about 6-7 minutes. Serve cold with roasted turkey, meats, or on a turkey sandwich. Jaden at Steamy Kitchen has a great post on honing and sharpening knives and is giving away some incredible knives too. Follow the link to her blog and see for yourself! Last night I had a cooking class for a group of twelve that was mostly couples. They were delightful and the dinner they made was too! Although preparations for the class prevented me from posting until today (Thursday), I’m sure to be forgiven when you taste this menu featuring some of the dishes we made last night. The pictures are a little out of focus, as am I, the photographer, after a full day of prep and cooking! Thanks to Jan and her friends for a great evening! My niece and I were watching TV on Friday night and settled on Are You Smarter Than A Fifth Grader. Apparently no one is home on Friday night, so the networks don't waste their best programming . . . or maybe they do . . . either way . . . yikes! One of the history questions was "In which war was the Battle of the Bulge fought?" There were three choices, but I won't list them here. I couldn't imagine anyone not knowing the answer, even without the choices. But it seems there are a lot of people who don't know, or don't remember. Today is Veterans Day, a day for us to remember and honor our veterans. If you don't know the answer to the question, don't ask a fifth grader. Ask a member of The Greatest Generation. Chances are they'll be able to tell you about it and give you the name of someone they knew who fought in it. My father served in the U.S. Army during World War II and he knows about the Battle of the Bulge. He and his veteran friends do much in our community to honor the memory of those who have served our country in the armed forces. My husband was in AFROTC during the 70's, when it was not the most popular thing to do on a college campus. He served on active duty for nine years and as a reservist for another fifteen, retiring as a Colonel. The Cold War ended during his service, but he was still around for the Gulf War. He flew KC-10 tankers and his reserve unit was activated. The F-15 unit from our base lost pilots and others were captured and held prisoner. The war that many watched on TV for a few days was not regular network programming, it was very real. And I don't want to forget my daughter-in-law. She is not a veteran herself, but she works with and cares for disabled and retired veterans everyday, as a registered nurse at a veterans hospital. Today is Veterans Day. It is a day for all those who served our country, in peacetime and in war. Military service means being on duty 24/7/52/365, and hoping you never have to do anything more than practice your job. Please remember everyone who has been willing to do that for our country and tell them thank you. They don't seek the recognition, but we are all well-served by remembering their contribution to our history. In the area where I live in Southern Illinois, many of the traditions connecting us to the land survive. This is a place where towns are small and neighbors are friendly. People are self-reliant. They take pride in what they can do for themselves. They fix things that are broken. They live in modest homes, drive sensible cars, wear jeans wherever they go and work for a living. Entertainment is usually connected to church, school and community events. Festivals are popular and it seems almost every community has at least one. I tell you this because I was reminded again over weekend just how fortunate we are to live here. Our neighborhood is made up of six streets - just thirty houses. Our lots are generously sized, so the area is large enough for a good long walk. We are kind of out in the country though, so there is rarely anyone on our streets who doesn't live here. As far as I am concerned, that's a good thing. When we moved in four years ago, our neighbors, Kenny and Phyllis, explained that there used to be an annual neighborhood get-together, but no one had organized one for a while. Together, we decided to revive the tradition and set about choosing a day in October and delivering flyers inviting everyone to our backyard for a potluck picnic. So this year was our fourth annual get-together and the turn-out and the food were both excellent. Nothing is organized, everyone is welcome, just bring a dish to share and maybe some chairs. We build a fire and provide hotdogs and s'mores. In our yard, we have a big jungle-gym, a little playhouse, a huge open area, and a pond with a bucket of food for feeding fish from the dock. The grown-ups stand around and talk, while the kid run around. Eating is when and what you want. Drinks are in the cooler. Yesterday, MFH got so busy chatting that he forgot to put out the stuff for the s'mores. He and Kenny had one while the four of us sat by the fire after everyone else had gone home. Tonight, Kenny and Phyllis called to say they had been out today and picked a big bunch of autumn olives which they were going to make into jam. Did I know what autumn olives were and did I want to come watch? No I didn't, and of course I did. You see, I am two generations removed from the people in my family who lived close to the land. Kenny and Phyllis have maintained their ties in both personal and professional ways. They are a wealth of information on these matters. I got my lesson with autumn olives and so much more -- just as I expected -- as I watched Kenny make a batch of jam with the bright red berries. The taste is somewhat like a pomegranate, but a little sweeter, and the lycopene content is much, much higher than tomatoes. Kenny and MFH talked about all the mushrooms this year and which were edible. I doubt that MFH will be foraging, but he likes to know these things. We talked about raising hogs, which Kenny's family did when he was young -- back when "heritage" breeds were just plain old pigs. We talked about pecans and hickory nuts and tasted some delicious little pecans from their trees. We ate the last few raspberries from their garden and tasted zucchini relish Kenny made earlier in the summer. I asked Kenny about his plan for getting a hive of bees next spring. Dan, our neighbor to the side, has had bees for a few years, but his left last year, so both he and Kenny are getting new bees next year. I have always been fascinated by bee keepers, so I'll be there checking that out. I'm also getting a pecan tree to plant from Kenny. And I came home with enough autumn olives to make my own batch of jam. We tasted persimmons they picked today to take to Phyllis' mother to be baked into bread tomorrow. I hadn't tasted a persimmon since I was in grade school, where one grew next to the playground. Phyllis gave me a copy of her mom's recipe and promises a taste of bread when it's made. Tonight was a reminder of just how important it is to stay connected to the land. It is possible to grow your own food and even to forage for it too -- really eating local. We're not all farmers around here anymore, but most of us know someone who still is. Some may see our area as rural and economically depressed, but they are not seeing what I see. We have gardens, and trees, and woods, and ponds, and fields, and neighbors. We are connected to the land and to each other. And that makes us rich in so many important ways. Preheat oven to 375 degrees. Grease and flour loaf pans. In a large bowl, cream together shortening and sugar. Blend in water, eggs and persimmon pulp. In a small bowl, blend flour, salt, baking soda, baking powder, nutmeg, cloves and cinnamon. Add dry mixture to persimmon mixture and stir until well blended. Stir in chopped pecans. Pour into prepared loaf pans and bake 1 hour. Makes 1 large or 2 medium loaves. Last week I enjoyed dinner with friends at a delightful new restaurant in Pinckneyville. Luke’s Shade Tree Café is a charming place with a decor that reminds me of upscale restaurants I’ve visited in much, much larger cities. The menu offers many breakfast and lunch favorites, along with some unexpected choices like organic hot cereal, homemade pastries and preserves, duck confit salad and a “TBP” sandwich with roasted turkey, blue cheese and pear. The dinner menu is a sophisticated take on seasonal foods. The night we were there the menu included Pumpkin Soup and a Duck Quesadilla for appetizers. Main courses were a Grilled Ribeye and potatoes, Grilled Pork Chop with Sweet Potato Corn Bread Pudding and Wilted Cabbage, Braised Short Ribs, Bacon Wrapped Duck Breast Stuffed with Apple, Pear and Cranberry Chutney, Chicken Pot Pie, and Braised Swordfish & Shrimp Over Hand Cut Fettuccini. I had the Grilled Pork Chop and thought it was delicious. The presentation was beautiful, the pork chop was big and juicy, and the sweet potato corn bread pudding over wilted cabbage complimented the pork perfectly. I also tasted the Duck Breast, which was beautifully presented and flavorful. Chef Ryan Luke and his wife Zoe understand the importance a restaurant can have in a small southern Illinois community and have set out to offer that, and more, in Pinckneyville. How nice to have a warm and friendly place that serves breakfast, lunch and a fine dining dinner menu in a restaurant so close to home. Luke’s Shade Tree Café is open Tuesday through Saturday from 7 a.m. – 5 p.m. for breakfast and lunch. Sunday hours are 7 a.m. – 4 p.m. Dinner hours are 5 – 9:30 p.m. on Friday and Saturday only. Beer and wine are available. And there are even tables on the front porch so you can enjoy the beautiful fall weather. After the wonderful pork chop and bread pudding at Luke’s, I couldn’t stop thinking about the warmth and comfort of roasted meats and root vegetables flavored with aromatics and served with a hearty helping of stuffing or savory bread pudding. The first chilly morning usually makes my mind leap forward to preparing cozy dinners and huge holiday meals for family and friends. Immediately I start digging through my files for old favorite recipes and those I set aside to try. Around my house, a roast is usually too big a meal for just the two of us. Most of the time, I like to pan roast chops or maybe a chicken, which will serve us for dinner and lunch the next day. But holidays are something special and a roast is the perfect choice for a big family meal, along with all the wonderful side dishes possible with fall and winter vegetables. And best of all, roasting meats is easy! Roasting means to cook with dry heat, usually inside an oven and should not be confused with braising, which is cooking meats with liquid in a covered pot. The great conundrum of roasting meats is whether to cook them fast at high temperatures, or low and slow. There are varying schools of thought on this matter but, as with most things, it depends on what you are cooking. Shirley O. Corriher, the wizard of food science on Alton Brown’s Good Eats show, who wrote Cookwise, the 1998 James Beard Award winning book about the science of cooking, says long, lower temperature roasting is best for larger pieces of meat. Smaller cuts like steaks and chops do well when seared and then roasted at a higher temperature for a shorter period of time. Large cuts of meat, some known simply as “roasts”, benefit from low and slow cooking to yield meat that is rarer on the inside than the outside -- think prime rib! It is also an excellent way to give less expensive and tougher cuts of meat the flavor and tenderness we love. Meats and poultry pieces can be seared on the outside and then roasted at a temperature of 200 degrees until the desired inside temperature is measured with a meat thermometer at the center of the roast. Searing does not “seal in juices” as once thought, but it does give the meat a more appealing color and a crisp crust which is desirable as a flavor enhancement. The meat is then cooked to the desired degree of doneness, according to taste and safe cooking guidelines. Searing does bond the seasonings on the outside of the meat and produces a crisp, brown, caramelized crust, while leaving the meat tender and juicy on the inside. There is actually a scientific term for this, the Maillard Reaction. Smaller cuts are best roasted by searing on the outside to caramelize the exterior of the meat to give it a more pleasing appearance, thus increasing the flavor and seasoning with the crisp crust, and then roasting briefly at a high temperature. Rotisserie cooking is also a dry roasting method, using a spit to turn meat throughout the cooking process. A slow cooker is another good way to prepare a medium size roast, by making use of the small amount of moisture from root vegetables to help cook the meat. Any way you do it, roasting is a good way to serve a delicious meal without spending hours in the kitchen. Large roasts are easy to prep and the long roasting time leaves the cook free to do other things. Chops and steaks get a quick sear and can then be finished in the oven in about the time it takes to whip up a salad and steam some vegetables. Place large cuts of meat and poultry on a rack inside a roasting pan to cook. Do not cover the meat while roasting, this traps moisture and destroys the crisp crusty exterior. Always remove meats cooked at a high temperature when they are about 10 degrees lower than the desired temperature. The meat continues to cook for a few minutes out of the oven. Allow roasted meats to sit for 10-20 minutes after removing from heat to finish cooking and allow juices to disperse throughout the meat, if you cut too soon, the juices will end up on the plate. Adding fats to leaner cuts of meat during the roasting process will improve flavor. Fats can be rubbed underneath the skin or on top, and can be basted on during cooking. Always use a meat thermometer and a temperature chart to guarantee your meats, especially poultry, are cooked to a safe internal temperature. Don’t guess! Roasting is also a great preparation for root vegetables like celery root, beets, turnips, carrots, parsnips, potatoes, sweet potatoes, and aromatic bulb vegetables like onions, garlic, fennel and leeks. Placed in the roasting pan along with the meat, these vegetables will impart delicious, subtle flavors throughout the roasting process. The natural vegetable sugars will also caramelize when cooking and the flavors will become rich and concentrated. Seasonal roasted meats and vegetables are excellent choices for holiday or special event meals, but are also good for Sunday dinner because there are sure to be leftovers to transform into a simple dinner later in the week. I’m still thinking about that “TBP” sandwich at Luke’s. I see one of those in my future – perhaps the day after Thanksgiving. Now I just have to decide if I want the “B” part to be Blue Cheese or Brie. What do you think? Decisions, decisions . . .
Puree onion, carrot, celery, garlic cloves, shallots, oil, flour, rosemary, salt and pepper in food processor. Place beef in roasting pan. Rub beef with vegetable and herb puree, covering completely. Let beef stand 1 hour at room temperature. Preheat oven to 500 degrees. Roast beef for 20 minutes. Reduce oven temperature to 375 degrees. Continue roasting beef until thermometer inserted into center registers 130 degrees for rare roast beef – about 1 hour and 45 minutes longer. Remove roast from oven. Let stand 20 minutes. Slice and serve. Serves 8. 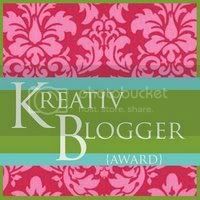 My new blog friend from Webbie's World, who found me through Contessa's Kitchen, has given me an award! It's my first ever and I owe it all to my friend Ms. Libba, who sent her friends at Contessa's Kitchen to check out my blog. The award comes with a 7's meme, so I'm going to give it a try -- another first. Thanks to Brenda for the kind words - "My new cyber buddy Cora at Cora Cooks, her sight makes my mouth water." Be sure to visit Webbie's World, as soon as you leave here. 2. J. C. Penney Catalog Dept. 2. What should we have for dinner? 3. Where shall we go for dinner? 6. What day is it? And now I'm supposed to pass this meme along to seven other bloggers I enjoy. I've only recently been getting to know some of my fellow bloggers, but there are a few that I have followed for quite some time. Although I'm not sure they are into memes, I would still like for them to know that I admire their work. 1. Kalyn Denny, of Kalyn's Kitchen, is one of the first blogs I read regularly -- and still do. Kalyn has great recipes and a true dedication to her purpose and her readers. 2. Alanna Kellogg, of Veggie Venture and Kitchen Parade, has a blog and writes a regular food column for her local newspaper. She also lives in the same town where my son and daughter-in-law live near St. Louis. She has been generous with her time and blogging wisdom and she has an amazing repertoire of recipes -- my go to resource for vegetables dishes. 3. Susan, at Wild Yeast, is my bread-baking idol. Her breads are beautiful. Her writing makes the art of bread baking sound easy as can be. And she built her own brick oven. Amazing! 4. Reading Ree, at The Pioneer Woman, is a true delight . Every time I read her blog, I envy her spirit and her authentic voice. 5. Food Rockz is another favorite I have followed for a while. I like his devotion to the farmers' markets in DC, his beautiful photography and his tastes in food and recipes that as so similar to my own. 6. I met Maris, who writes In Good Taste, at the BlogHer Boston conference last month and I've been reading her ever since. I love her fresh and thoughtful outlook on life and her articulate youthful voice. Oh to be so young again and know what I know now! 7. And finally, Lydia, of The Perfect Pantry, is another food blogger I met in Boston. We share many of the same food and writing experiences and I love her focus on the pantry -- and important part of my kitchen too. Has another week gone by already? But wait. This Wednesday is something special, isn't it? Oh yeah! No more political ads! We can get back to our regular programming . . . er . . . lives. That's a good thing! Today's menu celebrates the end of the election season by paying tribute to the city of Chicago, Illinois. As I watched the election returns last night, I really wanted a good old Chicago pizza, but there I was, sitting in my kitchen, 300 miles away. My brother and sister-in-law live on Michigan Avenue, right across the street from Chicago's Grant Park, the scene of last night's victory party. I bet it would have been a difficult night to get a pizza delivered anywhere near Grant Park. It is possible to make pizza at home, though. And it's not really difficult. In fact, it can be fun, if you get everyone involved in making his/her own mini pizzas with personalized toppings. Making the dough a day ahead means pizza night is FAST and EASY and FUN. The dough and sauce recipes I use were adapted from Martha Stewart. I've tried others through the years, but I always come back to Martha . . . and that's a good thing too. For dessert? Chocolate! My favorite brownies, from my mother-in-law's recipe. She was from Chicago. They have frosting on them . . . chocolate frosting . . . another very good thing. Especially with a little vanilla ice cream. So here's to Chicago, where good things are possible -- great pizza, frosted chocolate brownies and becoming President of the United States.